Reports suggests that there was gas in the pipeline during the maintenance procedure and a spark that emanated from a metal plate reacted with the gas to cause the fire. 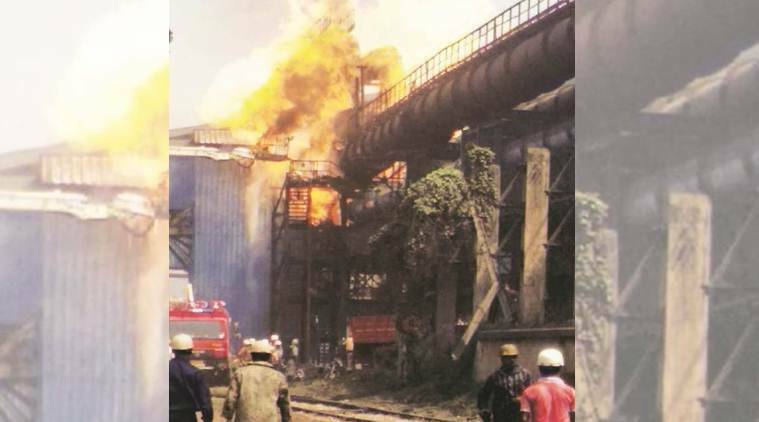 A preliminary investigation by Chhattisgarh government’s Industrial Health and Safety Department into the Bhilai Steel Plant accident on Tuesday has found that maintenance procedure being carried out at the time of explosion was done “without assessing the dangers”. It is learnt that a report compiled by Office of the Deputy Director of the department and sent to the state administration suggests that contrary to norms, there was gas in the pipeline during the maintenance procedure and a spark that emanated from a metal plate reacted with the gas to cause the fire. The toll in the explosion climbed to 12 on Tuesday. While the SAIL plant administration had said nine men died Tuesday night, three more succumbed to injuries on Wednesday. Union Steel Minister Choudhary Birender Singh visited Bhilai Wednesday and said action had been taken against three senior officials. He also announced compensation for families of the victims. CEO M Ravi has been asked to go on leave and General Manager, Safety, T Pandyaraja and DGM, Energy Management, Naveen Kumar have been suspended. “An enquiry at the incident site has made clear that Coke Oven gas had not been fully emptied from the gas pipeline, and the MS plate which was opened from the flange and deblocking done was a completely unsafe procedure,” the report said. A SAIL official explained, “Metallurgical coke is produced by destructive distillation of coal in ‘coke ovens’. Prepared coal is ‘coked’, or heated in an oxygen-free atmosphere until all volatile components in the coal evaporate, resulting in production of a residue — coke. Most metallurgical coke is used in iron and steel industry processes such as blast furnaces to reduce iron ore to iron. Coke manufacturing includes preparing, charging, and heating the coal; removing and cooling the coke product; and then recycling the oven gas. On Tuesday, while blocking the main pipeline for maintenance was underway, an explosion seems to have occurred. Typically, when the blocking is done, a meter is used to check if all gas has been removed and the line is depressurised. Then, through the joints, a sheet is inserted to isolate the pipe for repair… There was probably some gas left in the line,” the official said. Birender Singh said that apart from entitlements, a compensation of Rs 30 lakh will be paid to families of the dead, Rs 15 lakh to those with major injuries and Rs 2 lakh to those with minor injuries. One member of the families of those who died or suffered major injuries will get a job, said Singh, adding that these steps will be taken after taking permission from Election Commission as model code of conduct is in the force in the state.